Unabridged 8-CD Audio Book. Discover how one man spread the gospel in spite of horrific opposition. "An inspirational and heroic story of a radical Christian in the house churches of China. This book is like reading a modern day version of the Book of Acts." - Mark Stibbe. 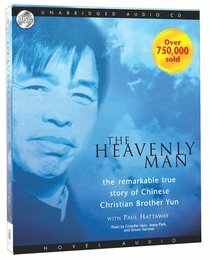 About "The Heavenly Man (Unabridged, 8 Cds)"
The dramatic autobiography of one of China's dedicated, courageous, and intensely persecuted house church leaders. This is the gripping story of how God took a young, half-starved boy from a poor village in Henan province and placed him on the front line for Jesus, in the face of impossible odds. Instead of focusing on the many miracles or experiences of suffering, however, Yun prefers to focus on the character and beauty of Jesus. Interspersed with his personal account are contributions from his wife, Deling, made mostly during her husband's frequent periods of imprisonment. You will remember where you were the first time you read this life story. It's a watershed book that will turn the reader to prayer and praise. It deserves comparison with past classics such as "Tortured for Christ" by Richard Wurmbrand, or the "Life of Watchman Nee,"
Brother Yun is a Chinese preacher and evangelist whose life has been marked by both hardships and miracles through his intense desire to reach China with the gospel throughout the late 20th century. He is also a leader of the "Back to Jerusalem Movement" which seeks to send thousands of missionaries out from China into the least-gospel-reached countries of the world, most existing between China and Israel. He now lives in Germany and is married to Deling and has two children. Books about Yun include Living Water:Powerful Teachings from the International Bestselling Author of The Heavenly Man and The Heavenly Man.